One of the easiest ways to have a productive day is by establishing a good morning routine. Doing these 6 simple things makes such a difference for me! After enjoying a less structured summer schedule, we’re slowly shifting gears and trying to establish a good, daily routine again. 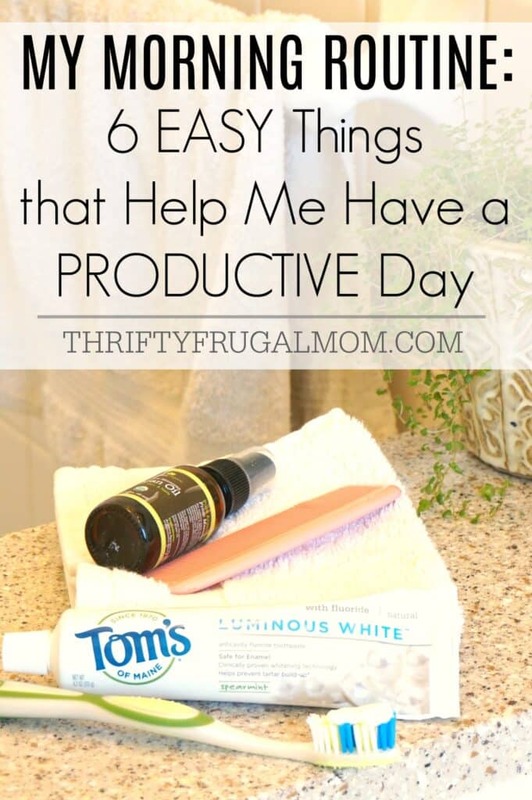 We homeschool our kids and have 2 that are in school this year so it feels pretty important that I get back into a morning routine that helps me have a productive day, and feel successful! For a long time, schedules and routines felt restrictive to me, and so I resisted them. I like the freedom to be spontaneous and hate being tied to doing things a certain way. Besides, I’m a mom of young kids and we all know that means that all sorts of unexpected things are bound to happen and “mess up” the best-laid plans! But the truth is, whether we like it or not, routines are proven to help increase productivity and success. Eventually, I made the happy discovery that routines can be simple and easy, yet also still quite effective. And that’s when I quickly became a fan! Oh, and if you’re a bit of a perfectionist like me and are worried that if you start a routine, you won’t always be able to do it, don’t let that stop you! Because here’s the thing—even on days when things don’t go as planned and I end up only doing half of my routine, I’m always amazed at how much of a difference doing even just a few of these things makes. Yeah, yeah, I know. If you aren’t already a bed maker, you might not have wanted to hear that. But here’s the thing. Making my bed helps me have a successful day in two ways. It’s an easy way to give me an immediate sense of accomplishment (hey, I completed one task already!) and it also is something that continues to make me feel accomplished throughout the day every time I enter my room and see the neatly made bed. If you don’t like to make your bed, I suggest finding another easy task that you can quickly do every morning that will give you a similar sense of accomplishment. I’ve never been someone who got a kick out staying in my pajamas all day. Instead, the rut that I got into was that any day that I was just going to be at home, I’d wear old, not-so-nice clothes and often not really “get ready” and look nice, if you know what I mean. The thing is, I noticed the days that I took the time to put a little more thought into what I wore and how I looked I was so much more productive! Because when you feel good about yourself and how you look, you also tend to feel happier, more confident and ready to take on the day. At least I do! 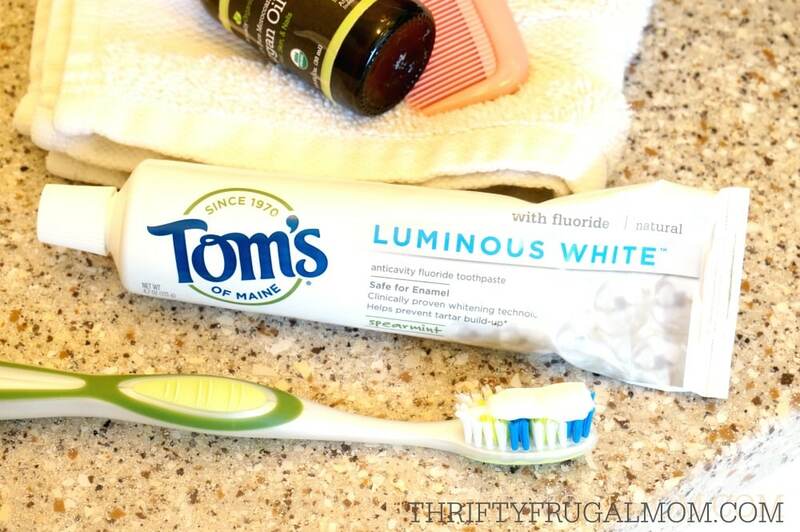 The fun thing is I recently picked up some new Tom’s of Maine® Luminous White™ Toothpaste Spearmint at Giant and now not only can I clean my teeth with a brand that has been a trusted name in natural products for over 47 years, I also can work at whitening them at the same time! I love that the Luminous White™ toothpaste is free of artificial colors, flavors, and preservative and is made up of biodegradable, mineral-derived ingredients. It’s been a great addition to my morning routine and is one of those simple little things that make me feel just a little bit better about myself! Like a lot of people, I struggle to drink enough. I’ve found though that if I drink a full glass of water soon after I get up, it makes it so much easier to keep drinking well throughout the day. Plus, hydrating my body right away also helps revive me, wake me up and get me going! I’m embarrassed to admit how many years I went without eating a breakfast of any sort. So.not.smart. There’s a reason that they say that breakfast is your most important meal! Giving your body good nutrition first thing raises your glucose level (which drops overnight due to not eating) and kick starts your metabolism, helping you feel energized and making it easier for you to focus. I can tell a big difference in how productive I am when I eat a nutritious, filling breakfast. It helps so much! Looking for good make ahead breakfasts? 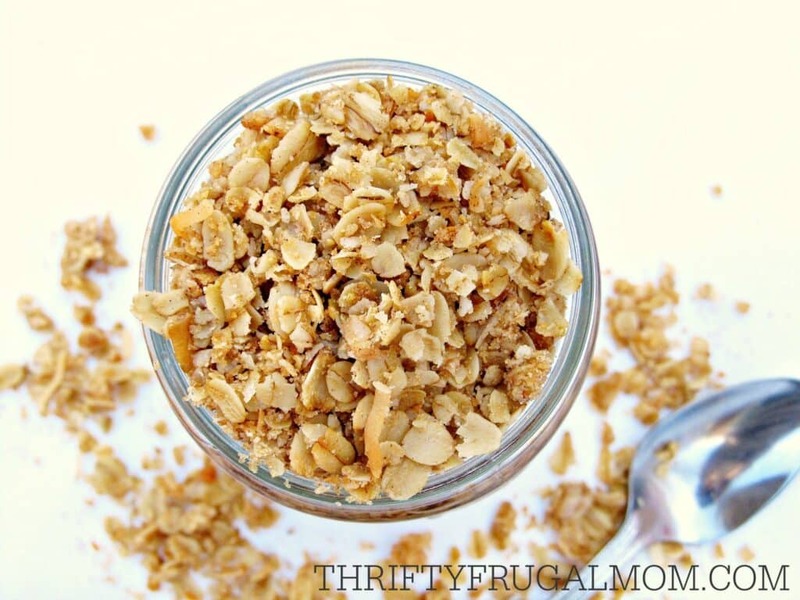 We love this Chocolate Chip Baked Oatmeal, Easy Homemade Granola. and Easy Homemade Yogurt. I always have a much more productive day when I have a plan of action in place. If I haven’t already done it the night before, I try to sit down first thing in the morning and make a list of everything I want to do that day. But I don’t stop with that! Next, I look at my list and decide what thing must get done and what things could easily get left until the next day. Those 2 or 3 tasks that must get done become my Most Important Tasks and get priority over everything else. That way if I accomplish nothing else that day, I’ll at least get those Most Important Tasks done! I like this because not only does it help me be more productive by focusing first on things that really must get done, it also means that I can feel successful at the end of the day too because I accomplished the things that were most important! If you’ve followed my blog for a while, you probably know how much I love my daily homemade frappe. It’s just one of those simple things that bring a little bit of happy into my morning and as a result, makes it feel a bit easier. I highly recommend taking the time to make your favorite beverage every morning. You might be like me and prefer a cold drink or maybe you’re more like my husband and enjoy something hot. Either way, sipping on your favorite drink throughout the morning is an easy way to add just a little bit of indulgence and fun into your morning, and I personally think it helps me be more productive too! Want to make your own homemade frappes like I do? Here’s my recipe for an Easy Homemade Caramel Frappe and Peppermint Mocha Frappe. Or give this Warm Vanilla Custard Drink a try! 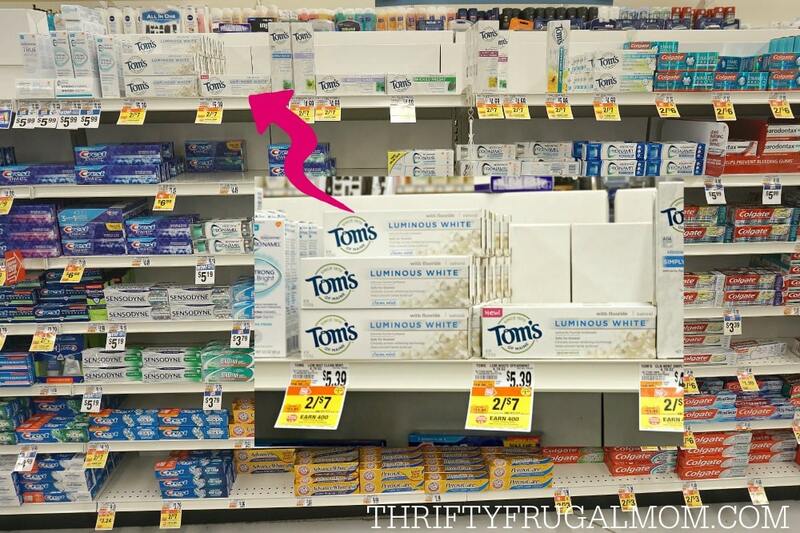 Interested in getting some Tom’s of Maine® Luminous White™ Toothpaste to try yourself? Look for it at your local Giant grocery store! I found it on the top shelf of the toothpaste aisle in my local store. What are your favorite ways to have a productive day? Anything you add to your morning routine that I don’t do? Tired of feeling constantly behind or overwhelmed with your daily life? 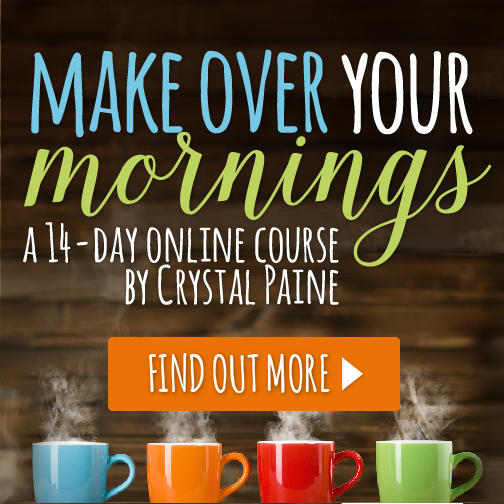 I learned so much about the importance of routines, especially morning routines, from the Make Over Your Mornings online course by Crystal Paine. Her tips will help you take control of your day and stop the overwhelm. I highly recommend it! That's a great idea, Amy! Gratefulness is such a powerful thing and a good way to start your day off, for sure! Nice morning routine. Having a homemade frappe sounds like an awesome treat. Thanks, Helen! Yes, my homemade frappe is one of my favorite routines...just a little fun spot in my morning! Hi! I enjoyed this post! I have a similar post on my blog. Although, I didn't write about making the bed, but I definitely agree it's the first thing you should do! It's such an easy way to make you feel like a quick success, isn't it? Love this! Such great tips for streaming my morning. Love Tom's, especially for my kids. Thanks, Kim! I find that streamlining my mornings is so key to getting the day off to a good start.